Ensure you're protected against power failures—and surges—keeping your machine powered with one of the best uninterruptible power supplies. The chaos and horror that is a a mid-gaming, or even mid-normal-use, power failure that affects your PC is almost unparalleled. These failures can of course be really quick and low-impact, but they can range to data-losing, save-ruining, progress-smashing extents. Ruinous, no matter what you're doing. And then, to make matters worse, your PC is then at risk again when the power returns (due to power surges). If it happens, get those prayer beads, positive thoughts and good luck charms at the ready. But, there is one method to try and head this danger off before it even strikes, and that's by getting a backup power system. It doesn't scream ‘must-have purchase’, particularly for more casual PC users, but the Hitchcock-ian thought process that the unknown fear is greater than the known fear, is almost enough in it self to warrant getting one for the safety net it offers. In terms of gaming, for example, you’d absolutely never want to experience a power failure at the end of that extremely long quest for loot or a when a mega-raid comes finally to an end. Should such an insurance policy appeal, then you’ll be after one of the best uninterruptible power supplies for gaming. In a way, we naturally hope that we purchase them never to have to use them and the cash they cost is almost 'wasted', but they will sit there quietly ready to pounce should the worst happen. As well as the protection they offer, they will keep you going after the initial blackout occurs, hopefully for as long as the power is out for. Our top recommendation for gamers remains the CyberPower's P1500PFCLCD 1500VA but below you’ll find a range of options, each individually recommended with corresponding ‘levels’ of PC usage in mind. The CyberPower CP1500PFCLCD 1500VA is one of the best UPSes on the market. Several factors contribute to it being our top pick for most gamers. First, the CP1500PFCLCD 1500VA has enough juice to handle the majority of gaming machines on the market, even if you're running dual GPUs. Unless you've got systems with 10 hard drives, quad-way GPU, and other accessories, the CP1500PFCLCD should have enough juice to last 10-20 minutes (longer if you have a more moderate rig) if a power failure occurs. Given its ample power reserves, the CP1500PFCLCD is also a great pick coming in at less than $220 for a 900 watt unit. This is a stunning price as just several short years ago, a similarly specced UPS would easily approach $500. One of the most important features of the CP1500PFCLCD is its true sine-wave output. Most UPSes in its price range only provide simulated sine-wave output, which is a stepped sine-wave that approximates what you get out of your wall outlet. Some electronics are sensitive to simulated sine-waves and will behave abnormally. At $214, having true sine-wave output is basically unheard of, so kudos to CyberPower for delivering on quality power output. For smaller accessories and network equipment, the CyberPower EC650LCD is the best pick for most people. At a price point of less than $60 for 390W/650VA, the EC650LCD has enough power reserves to keep the average home network alive for well over 15 minutes, which is enough time to exit your game/applications, save all your work through the network, and shut everything off gracefully during a power outage. The EC650LCD is also small enough to hide away, taking up very little desktop room for a 390W unit. One of my favorite features of the EC650LCD is its array of ECO ports. Essentially, these ports can be managed and timed to turn on or off depending on your schedule or use case. The ECO ports will also power down accessories like your speakers and displays if your PC is asleep or powered down. There are four surge-only sockets, three of which are ECO mode sockets, and four battery backed up sockets. I also like the fact that two of the ports have extra clearance around them for devices that have huge wall warts. The best use case for the EC650LCD is for connecting your displays and your network equipment. During testing, the EC650LCD successfully powered off both my display and my speakers when I powered off my PC. Power was promptly returned to both devices when the PC was turned back on. The name APC is synonymous with high-quality UPS products. 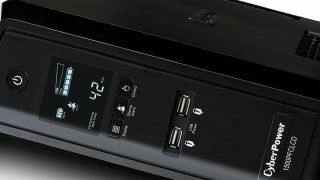 I myself use three of the company's Smart-UPS professional level units at home: two 1000VA units for my network and NAS gear, and one 1500VA unit for my PC and displays. Out of the units that APC sent me, the BE600M1 Back-UPS was my favorite and one that is perfect for most users who want to protect their accessories and lower powered products, such as routers and peripherals. The BE600M1 is small and is made for sitting on a desk, where ports are in an arm's reach for conveniently plugging in a laptop, tablet, or mobile phone. APC's BE600M1 is great at providing both battery and surge protection for the devices you use most every day. That is, your phone, and possibly a tablet. However, it has enough power reserves for you to plug in at least a router and a single display. If you only plan to use the BE600M1 to power a wifi router, the unit will have enough juice in it to let you browse the Internet in peace for several hours while you're deprived of electricity in the rest of your house. Priorities. The best part of the BE600M1 is its size. Most UPSes are large and belong on the floor, but APC encourages you to put the BE600M1 on a desk. The unit provides a single 1.5A USB port for charging a phone or tablet so you don't have to use your device's power adapter, which is inevitably a wall wart that potentially overlaps another socket or two, so you free up sockets for other devices.